In the shadow of the State House building in Downtown Annapolis sits a quaint, unassuming little shop. On one of my recent visits to Annapolis, I stumbled upon Capital Teas while meandering down one of the many side streets jutting off of Fleet Street. As soon as I walked in, the strong aroma of pumpkin filled my nose. One of their autumn tea blends, Pumpkin Spice, was brewing in a lovely crystal teapot fitted with a loose tea infuser. This was no ordinary tea shop – this was a tea shop for tea lovers. Open for a little over a year, Capital Teas brings the traditions of co-owner (and Maryland resident) Manelle Martino’s family to life. Tea planters and merchants for five generations, Manelle has continued in her family’s footsteps by opening Capital Teas in the heart of Downtown Annapolis. Buying from wholesale tea distributors from around the world, Manelle has created a vast and varied selection of teas from which tea connoisseurs can choose. Herbal, green, black and infused teas line the shop in crystal and silver tins, inviting shoppers to smell the various blends. Dotted among the loose teas are a wide array of tea pots, tea cups, infusers and decanters. A mug fitted with it’s own ceramic infuser and lid is emblazoned with an Asian inspired design, the Capital Teas logo or simply in one of many solid colors. An art deco tea kettle fitted with its own tea infuser comes in bright, vibrant primary colors, including red, yellow and blue. Silver tins labeled with various teas populate the shelves, often in gift towers wrapped in a single brown ribbon embossed with the Capital Teas name. And presiding over all things tea sits a painting depicting the tea party in Alice in Wonderland, Mad Hatter and all. When I first walked in, I was immediately drawn to the assortment of black teas, my personal favorites. I was pleasantly surprised to find a nice selection of organic black teas among the many crystal jars of loose teas. These blends included Organic Irish Breakfast, Darjeeling, Berry Berry and Rooibos blends, along with an Organic Oolong tea oddly called Slimming Tea (according to Capital Teas, this blend is “a fat burning tea with hints of orchid-like flavor”). I picked up the Berry Berry and could immediately smell roses and a hint of hibiscus. The robustness of the aromas filling the jars spoke to the strength and quality of the tea leaves. 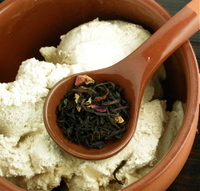 While there were the standard Earl Grey blends (both regular and organic), there were also such variations as Versailles Lavender Earl Grey and Cream Earl Black. 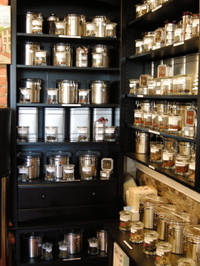 The shop is also known for its three signature blends, Annapolis Treasures, Queen Anne’s Pearls and Sailor’s Delight. 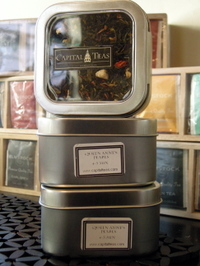 Annapolis Treasures is a blend of green and black teas, accented with the flavor of peach. Opening the jar and taking a whiff, the notes of peach became very apparent. Trailing slightly behind, however, was a lovely hint of vanilla. The Queen Anne’s Pearls blend has a more nutty flavor interwoven amongst the green and black teas. The sales clerk told me it was almond I was smelling when she saw the puzzled look on my face as I tried to place the aroma. When I got to the Sailor’s Delight, my mouth instantly watered at the fresh smells of strawberry and papaya permeating the tea. Also a green and black blend of teas, the Sailor’s Delight is one of the shops best sellers. All the other teas fell to the waste side when my eyes fell upon a jar labeled “Rose Tea”. Growing up in Germany, rose and rose hip teas were common blends found in many households. When we moved to the States, my mother had a harder time finding good quality rose hip and rose teas, even in the grocery stores on the Army bases. The blends are either have weak rose flavors or are overpowered with an almost bitter after taste of burnt flowers. To find a good quality blend of rose tea is difficult, even in this age of the Internet. On my first visit to Capital Teas, I only bought 2 ounces of the rose tea blend because I wasn’t sure of its quality. When I got home and brewed my first cup, I was in heaven. The loose rose tea is populated with dried rose petals, giving it the right amount of rose flavor without overtaking the black leaves. Even though it was cold outside, my thoughts immediately went to incorporating these flavors into an ice cream. With my handy little automatic ice cream maker, I set about trying to recreate the rose tea in the form of a frozen treat. In a medium saucepan on medium heat, combine the milk and cream. Pour in the sugar, whisking until it has dissolved into the liquid. Stir in the vanilla and then add the loose tea. Stirring consistently (this is to keep the loose tea from sticking to the bottom of the pan), allow the mixture to steep for 5 to 10 minutes (steep longer for a stronger flavor). Keep an eye on the flame to keep the mixture from boiling. Once the mixture has steeped long enough, remove it from the heat. Using a sieve, separate out the tea leaves from the milk and cream mixture and pour the mixture into a bowl. Refrigerate it for at least thirty minutes, allowing the mixture to completely cool. From this point, follow the manufacturer's instructions for your ice cream machine. Once the mixture has churned into an ice cream, place it in a freezer safe container and allow the ice cream to harden to your preference. 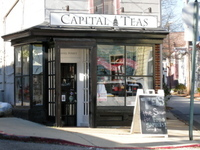 If Downtown Annapolis is too far, visit Capital Teas website where you can purchase teas and all things tea related to be shipped anywhere in the United States. Capital Teas, located at 6 Cornhill Street, is open seven days a week (closing at 6 pm during the week and 7 pm on Friday and Saturday. However, on my many visits, I have found the knowledgeable and friendly staff and the relaxing environment to be as much of a draw as the teas itself.